Google didn’t stray too far from the norm when they created the keyboard for the Chromebook. 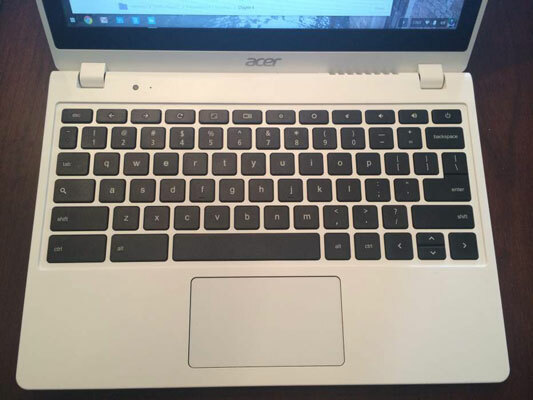 This figure shows the keyboard on the Acer C720P. Check out the top row: If you’ve done much work on a Mac or a PC, you probably remember the function keys (F1 through F12), used as shortcuts for various operating-system-specific functions. On Chromebook, the function keys are gone, replaced by a series of more intuitive keys, called shortcut keys. Esc: Often used to stop a process. In the web browser, it stops a page from loading. Back: Navigates to the previous web page. Forward: If you navigated back a page, use forward to navigate forward. Refresh/Reload: Reloads your current web page. Full Screen: Makes the current window full-screen, without the menu bar or other ancillary window controls. Reveal All Windows: If you have multiple windows open, this reveals them all on the screen at once so that you can quickly click and navigate between windows. Dim: If you’re in a dark environment, you may want to reduce the screen’s brightness so that the light emitted isn’t a disturbance to others. Brighten: If you’re in a bright environment, you may want to brighten your screen because the screen may be too dim to see. Mute: Quickly eliminates all sound coming from your machine. Volume Down: Decrease your machine’s volume incrementally. Volume Up: It’s time to party, turn up the volume! Power: Turn your Chromebook on or off by pressing the Power key. The remaining keys on the keyboard are more or less what you’d expect — with the exception of the Search key, as shown here. Pushing the Search key opens the App Launcher and puts your cursor in the search bar so that you can quickly submit a search query. If you’re searching for an application, like Gmail, simply type in gmail and your Chromebook will open the Chrome web browser and load your Gmail. Maybe you want to quickly do a Google search. You can do so by entering your query in the search bar and pressing Enter. Chromebook will open a Chrome browser and load Google with your search results teed up. The last thing you should notice about the keyboard is that the bottom row of keys includes no Start key, Fn key, or Command/Apple key. 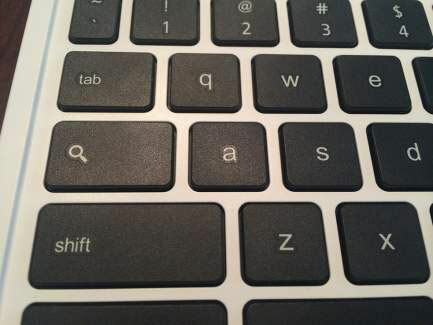 Instead, it simply has a Ctrl and Alt key on both sides of the spacebar. Ctrl and Alt are used quite a bit in shortcut combinations, so you might as well get used to them being there!